The popular 1N957B-1 through 1N992B-1 series of 0.5 watt Zener voltage regulators provides a selection from 6.8 to 200 volts in a standard 5%, 2% and 1% tolerance versions. 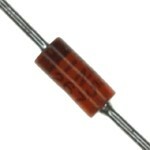 These axial-leaded glass DO-35 Zeners feature an internal metallurgical bond and are available in military qualified and commercial RoHS compliant versions. Military qualified versions are available on the 1N962B-1 through 1N992B-1 range of part numbers.